You already know the story, Thursdays at work is buffalo chicken day. I know, I keep talking about it. I didn't even used to like buffalo chicken, but then one day, many years ago, a restaurant accidentally served me a buffalo chicken sandwich. Instead of refusing it and waiting for the right sandwich, I just ate it. (Pre GF Days) I fell in love. Then there was the buffalo chicken dip at another restaurant. It was all down hill from there. I was so excited to discover that Frank's Buffalo Sauce is GF/DF! I have to admit, I've been cheating on the chicken tenders, buying Bell & Evans and cooking them in the oven then dipping them in the buffalo sauce. It works, but it's much better if you make the tenders yourself. The photo above is hand-breaded tenders. It's so easy! Heat a little oil in a pan. Set up your assembly line, I use buttermilk in this case = 1 C of rice milk + 1 Tbs of vinegar. Let the buttermilk sit for 5 minutes, then let the chicken sit in the buttermilk for 5 minutes. Roll the chicken in GF Bread Crumbs (I use Gillian's) and fry in the oil. A few minutes on each side. Let the fried chicken rest on paper towels to get rid of some of the excess oil before dipping into the buffalo cause. YUM! 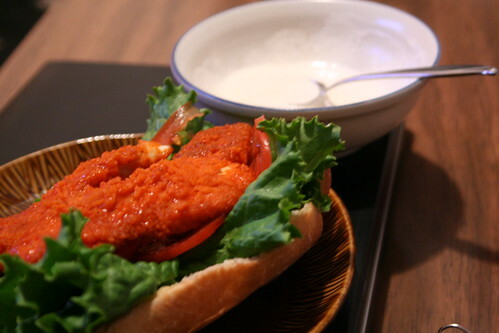 Buffalo chicken is HOT and what better to cut the heat then bleu cheese dressing? Well, I can't just go out and buy a bottle, and bleu cheese is out of the question for me anyway, so I had to come up with a compromise. I searched bleu cheese dressing recipes and made up my own fake version. I haven't perfected it yet, but it works pretty well. In a bowl I combine some mayo and some dairy free sour cream. Add a small splash of cider vinegar or regular vinegar and a squeeze of lemon juice. Sprinkle in some garlic and onion powder, salt and pepper. Mix it all up. Adjust to taste. Viola! It's definitely NOT bleu cheese, but it sure does the trick. I prefer my buffalo chicken served on a wrap (Food for Life) with lettuce and tomato and dipping sauce on the side. I just might have this for dinner again tonight! The sandwich in the photo above was made with a schar sub roll, but it was too much bread. A wrap works much better. We are having a linky party over at Everyday Sisters and this week's theme is CHICKEN we would love if you would come over and share your favorite chicken recipes with our followers.